We start by listing ALL hotels / motels / vacation rental agencies in Indian Shores. As you check and uncheck boxes below, the number of matches will change automatically (above, in red). Search for exactly what you want, easily and quickly. We are the exclusive agents from Bay & Beach Club, located at 19508 and 19509 Gulf Blvd. We have buildings on both the beach side and bay side of Gulf Blvd. Huge hot tub, rates from $650 per week. We also have several other nearby properties, from the Redington Ambassador in neighboring Redington Beach down to Hideaway Sands Resort in St. Pete Beach. 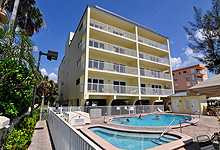 We specialize in Florida beach vacation rentals in both waterfront and beachfront condos. All of our condominiums are located in: Indian Shores, Indian Rocks Beach, Madeira Beach, Redington Shores, Redington Beach, and Sand Key/Clearwater. 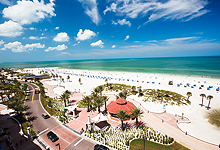 We are centrally located between Clearwater Beach and St. Pete Beach; just west of Tampa Bay and St. Petersburg to allow you plenty of vacation fun! Suncoast Vacation Condos has several properties up and down the Pinellas Gulf Coast. 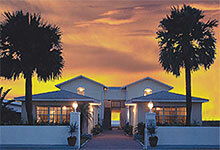 In Indian Shores, just south of Indian Rocks Beach, we offer Bay and Beach Club in Indian Shores. Enjoy the beach and the bay, all in one resort. See our extensive web site for complete details about all of our resorts. Entire site, © 2000 - 2019 Logical Sites, Inc.